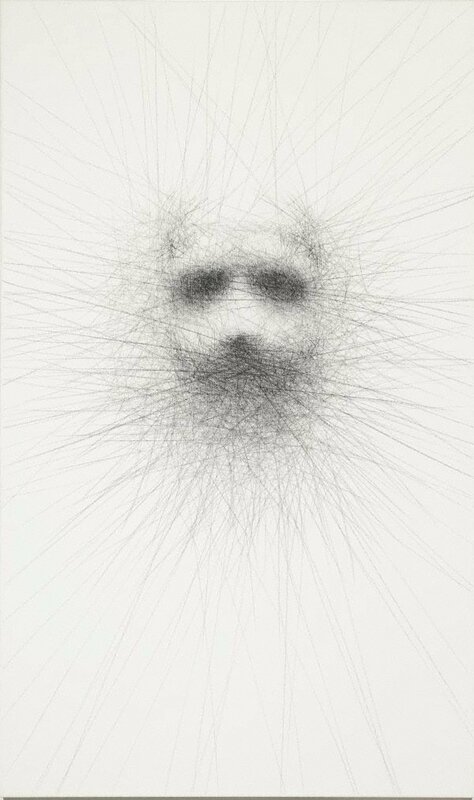 A face emerges from the schematic, delicate but slashing lines drawn by Ah Kee with charcoal on canvas in ‘Unwritten #9’ 2008. This work is from a small series in which rather than delineating form with carefully drawn lines and shading, the face seems to appear almost by accident from a convergence of lines on a blank background. The affect is of a form of automatism with a ghostly and haunting face appearing unexpectedly - the eyes are back voids and the mouth is a gathering of darkness. If the face appears like a ghost or with the muteness of a death mask it is because there was a specific reference in this series of works. Ah Kee made them in response to the death in police custody of a young man, Mulrunji, on Palm Island in 2004. The apparent police cover up and protection of their own lead to accusations of racism, riots by the Islanders and their further oppression by the police. Ah Kee’s response is to conjure these faces from his charcoal pencil lashing across the canvas. While there was an originary moment in the Palm Island riots, the faces are also non-specific, referring to the haunting history of racism and violence against indigenous peoples in Australia. This powerful presence also suggests the often unspoken motivations for actions and interactions between Australians of different racial and ethnic backgrounds today.